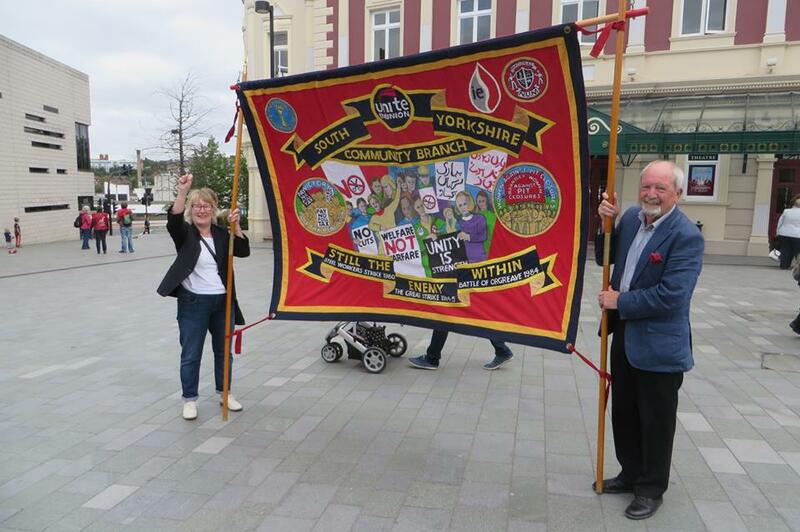 South Yorkshire Community Members were delighted to get the chance to see Jeremy Corbyn yesterday in Sheffield and took the opportunity to distribute 100’s of our flyers urging those not in employment to organise within our Community’s. See a snap shot of Jeremy’s speech highlighted above where he talks about solving the countries housing crisis, helping people back into work and reducing the Welfare bill! sensible policy’s that reject the Madness of Austerity and paint a vision for a healthy society built on need rather than cruel and unnecessary cuts and poverty wages. 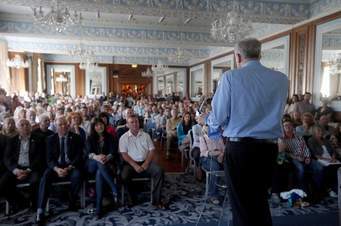 Yet again 100’s of people packed the meeting and 100’s more attended the overflow Rally outside proving that Corbyn’s policy’s are attracting the attention of the massive sections of our community. Tony Blair has been attacking Corbyn yet again today talking about “Alice in Wonderland” ideas, but it seems the more Corbyn is vilified by the right the more support he attracts! see below some photos from the Rally including our fantastic banner of Course! Jeremy Corbyn is coming to Sheffield! 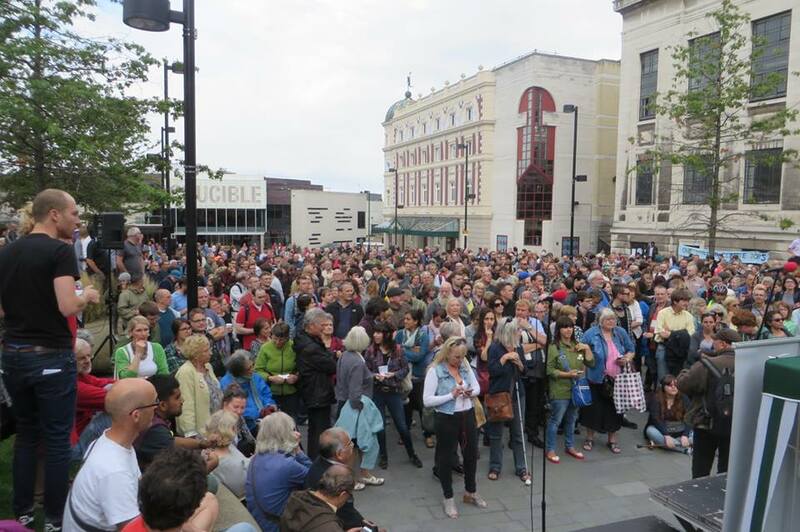 He will address a meeting at 2pm on Saturday 29 August at the Crucible Theatre, Sheffield, with overspill in Tudor Square…. Unite Community South Yorkshire Branch will be running a stall at this event come along and help out and say hello! Below are Pictures from Previous Rally’s! Come and join 1000’s of others the time for real change has come! 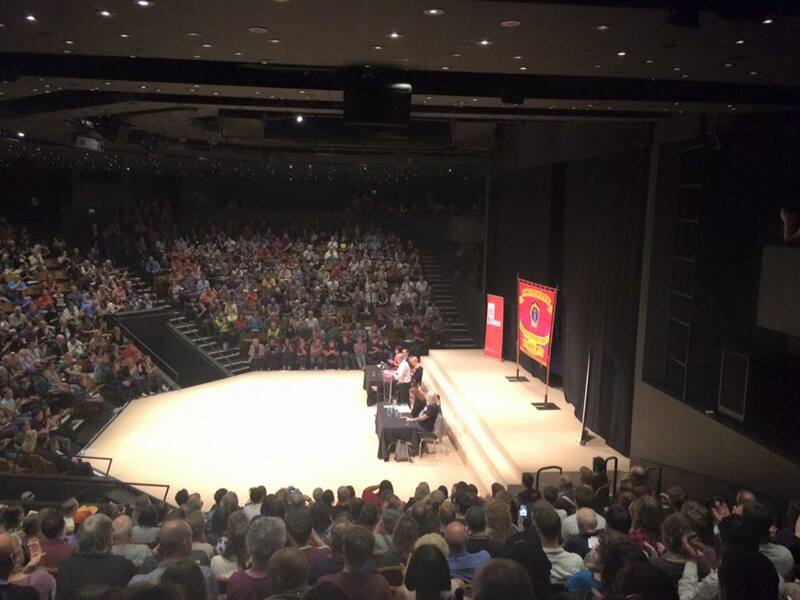 Comments Off on Jeremy Corbyn is coming to Sheffield! If you are a Labour Party member or affiliated/supporter, your ballot in the leadership election should have arrived today or within the next few days. For registered and affiliated supporters this will be by email (unless you do not have an email address) so please check your inbox! United Left is supporting Jeremy Corbyn. UNITE Executive Council recommendation is also to vote for Jeremy. If you want to use your second preference then UNITE’s recommendation is to vote for Andy Burnham as your second choice. Please see attached UL statement explaining why we think Jeremy Corbyn is the best choice. For Deputy Leader please choose between Angela Eagle and Tom Watson. Whoever you choose as first choice please place the other as second choice. These are crucially important elections which really could change the face of Labour Party and indeed British politics! But that’s only if the Labour Left vote turns out and delivers! 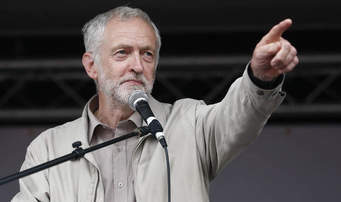 United Left, the highly influential left network of shop stewards and activists in UNITE The Union*, urges all trade unionists, their families and friends to participate in the forthcoming ballot for Labour Leader and cast their vote for Jeremy Corbyn. We urge a vote for Jeremy Corbyn because he is the only candidate who stands for a return of the Labour Party to working class values; for an end to austerity; for trade union rights; for an economy that works for ordinary people; for fairness and justice; for peace and international solidarity. We reject the criticism that a vote for Jeremy as Leader will alienate the voters and cast Labour into the wilderness for decades. On the contrary, there is huge support in the country for a return to a genuine centre-left agenda. 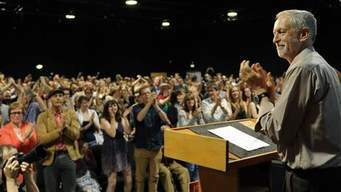 The massive surge of interest and support for Jeremy’s campaign is witness to that. By contrast the other contenders have run uninspiring campaigns with no new policies except a lurch back to the right. A return to the policies of New Labour will be disastrous for Labour’s chances in the 2020 election. Public services privatised including the Post Office, utilities and public transport, and now our NHS! Opinion polls have consistently shown majority support for a return to public ownership. A deregulated labour market that permits employers to exploit low cost foreign workers in place of workers who live here, fuelling racism, fascism and Islamophobia. People are fed up with a Labour Party which has no answers to the above. We don’t want a Labour Party that supports “austerity-lite”; that can’t even vote against Tory welfare cuts; that supports yet further pay restraint for public sector workers; that has no answers to the housing crisis affecting working class households across the country; that is embarrassed by its trade union connections and won’t reverse anti-union laws. Jeremy Corbyn is the only candidate who says there is an alternative to austerity. Austerity means massive spending cuts on vital public services and welfare, making the poorest in our society pay for a crisis not of our making. But this depresses the economy, reducing tax receipts and increasing public spending on poverty and unemployment. Instead we should be investing in our economy, getting businesses working again and creating jobs. This would generate tax receipts and reduce spending on welfare – and reduce the deficit. We CAN reclaim the missing tax billions (estimated to exceed £100B a year in taxes evaded or avoided by big business and wealthy individuals, or simply uncollected by an under-resourced Inland Revenue ravaged by senseless public sector job cuts). We CAN create a public investment bank to invest in our infrastructure, new council homes, public transport, renewable energy, insulation and much more, using the public sector as the motor for recovery. We CAN create decent well- paid jobs and place orders with private sector businesses which will generate tax receipts for the Treasury and reduce public spending on welfare benefits as we raise people out of poverty. We CAN offer a vision of hope for working people under a Labour Government, but it’s good for business too. Indeed it’s a much surer way of paying off the deficit than the destructive and divisive right wing policy of austerity. There is a brighter future under Labour. Vote for Jeremy Corbyn! United Left is an informal network of shop stewards and lay activists, but also includes full time officials. It is the largest broad left organisation in any union in the country. It campaigns for a strong fighting back trade union delivering for its members and for a left voice on political issues that affect working class people. It leads and influences the debate over policy within and without the union. United Left also supports candidates in union elections including for General Secretary and for the UNITE Executive Council (46 of the 63 members are United Left supporters). 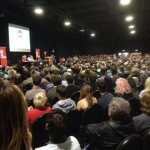 Jeremy Corbyn addressed the United Left national supporters meeting in Manchester on Saturday 25th July. The below outlines the position on voting in the Leadership election. Unite Community members can become affiliate Labour members, the same as our industrial members. 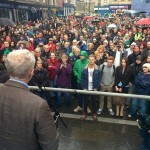 This link:http://www.unitetheunion.org/campaigning/unitepolitics/your-party-your-voice/ will allow them to do this. Trade union affiliate members can decide for themselves which candidate they vote for. In London, Unite has backed Sadiq Khan, this followed a Mayoral hustings in front of our London lay members who then voted on who to back. While Unite will recommend a vote for Sadiq Khan every union member who has signed up as an affiliated supporter can still vote for who they wish. 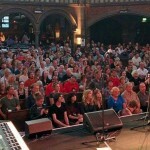 For the Labour leadership: on 30thJune there will be a Trade Unions for Labour hustings (all union’s affiliated to LP) – Unite’s lay elected Executive Committee and Political committee will be at that hustings and following it will decide who Unite will back based on policy positions on areas important to Unite members. But again it is only a recommendation and members decide on who they want to vote for themselves. Unite members can watch these hustings at the regional office (please ask the regional political officer for details if your members are interested).